The birthday of our nation is always a time of celebration and patriotism, so I wanted to share a few pictures and thoughts from my little part of the world. Here are a few pictures of display items from my shop--vintage flags and an Americana tray with picture of our forefathers. 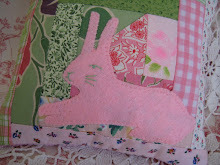 There is also a picture of a banner that I made using fabric from an estate sale. Here is a little handmade pincushion created from new and vintage materials. Standing atop the pincushion is a figure of George Washington found at an estate sale. His hand is on a Bible, and an image of the American flag is at his back. He is surrounded by a collection of new and vintage buttons and trims. Behind the figure, I sewed ribbon, tinsel, and wired gold beads to resemble fireworks. There are many American heroes, and we need to remember them all. But I wanted to share one who was closest to me. 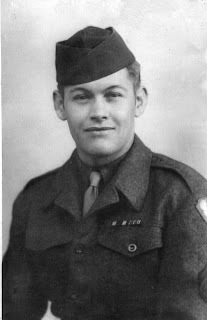 Here is a picture of my Dad, my American hero, who passed away last year. He was one of the bravest men I have ever known. He was a World War II veteran, who served in a medical unit in France during the Normandy invasion. One of his jobs was to pick up the wounded and dead on the beach during the invasion. 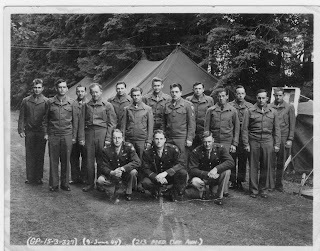 There is also a picture of his medical unit the day before they shipped out to Omaha Beach on June 10, 1944. He is the tallest in the middle on the back row. In June 1994 his family accompanied him back to Normandy, France for the 50th Anniversary of D-Day. 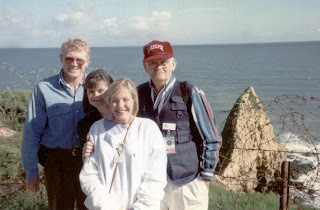 I am including a picture of my Dad and family standing in front of the Pointe du Hoc, a famous landmark, on Omaha Beach in Normandy. We accompanied a group of other veterans who landed on D-Day in 1944. Many of them talked about how the landing did not go as the military had planned. It was difficult getting off the landing craft because of all the dead American bodies floating in the water. Some of the veterans were paratroopers who jumped into battle at the Saint Mere-Eglise church where a famous paratrooper hung from the church steeple for hours. These men were not fighting on American soil, but they were paying the price for freedom in another part of the world. Most of us have lived in America without having to worry about freedom because someone else paid the price for us. On July 4, we need to remember those who have and continue to pay the price. I just want to keep my hand on that Bible like George Washington and say "Thank you for true American heroes." 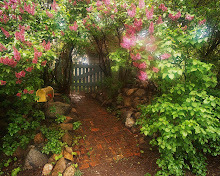 Thank you for visiting and leaving comments. Happy 4th of July to all my friends and visitors! I love your 4th pictures, and what a great looking dad. This makes me so proud and makes my heart swell. Thank you for posting it. I'm so very proud of you! Your Blog looks wonderful!! I've started my own blog here and I've added you to my blog list. I do enjoy reading your posts, do keep it up!